Thierry Lincou will play in the Canary Wharf final, after beating Peter Nicol in the final Jubilee Group match and edging ahead on points countback. Ong Beng Hee joined Nicol on two wins with a quickfire victory over Nick Matthew, and then Lincou levelled it all up by beating Nicol (who let slip an 8-4 lead in the fourth) to leave all three on two wins each. Games countback eliminated Beng Hee, and on points countback the Frenchman was a comfortable winner on +17 compared to Nicol's +9. Nicol will play in the 3/4 play-off. In the Canada Place group John White beat Lee Beachill in just under an hour, leaving the world number one to sweat on the result of the last match. 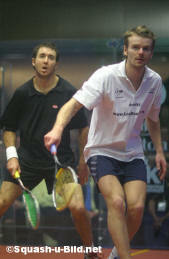 David Palmer could have done fellow-Aussie White a favour by Beating James Willstrop and sending White into the final. But with Palmer himself out of contention Willstrop knew that a win would send the Yorkshire youngster into the final, and he made sure he stayed ahead throughout. So it's Thierry Lincou v James Willstrop in tomorrow's final (who's Framboise going to support ??? 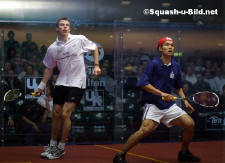 ), and Peter Nicol v John White in the 3/4 playoff. Martin Bronstein, my eminent colleague, says very rightly that I can’t add up. 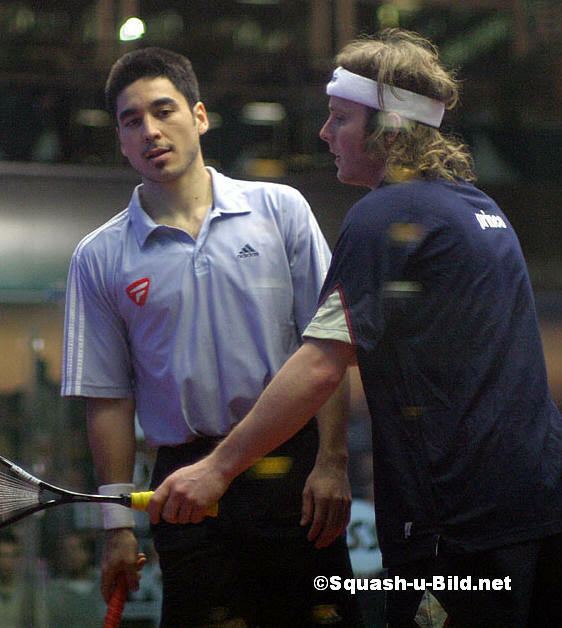 So I was absolutely convinced that if Nick Matthew, the charming young English player from Sheffield (I think, don’t shoot me if I’m wrong, it’s past midnight), lost against the born again player Ong Beng Hee, then Thierry Lincou was out of the race. So, once again (poor Ong must think I have something against him, and I haven’t, cross my heart, he is such a lovely discreet young man), I wished very hard that Matthew would win! Well, just like Thierry Lincou yesterday , a very determined and courageous Matthew couldn't find the key to the Malaysian iron defence. Yes, Nick made a few nicks, retrieved the ball pretty well, but Ong was lobbing, playing strong length drives, forcing Nick to retreat to the back of the court, and then execute his opponent by a lethal drop shot. Nick lost the first set 9/5 in 10 minutes. He decided then to quicken the pace, but Beng Hee's shots were glued to the wall, and Nick had very little space to create his own game. He was also driving and cross-court lobbing, and the rally at 4/5 with Nick serving was a veritable demonstration in retrieving, but Ong played a forehand drive too far for the Englishman. 6/4 for the Malaysian. Nick found the tin, loses a stroke, and with a final boast ending also in the tin, Beng Hee won the second game 9/4 in 7 minutes. The third was quite close: 3/3, 4/3, 4/4, 5/4, 5/5, 6/5, 6/6, 7/6. Not a relaxing walk in the park is it? So don’t think for a moment that Ong had it easy, or that Nick didn’t do his best. But Nick Matthew played 2 loose shots. And Ong Beng Hee seized the moment, pressurising Nick to make mistakes. One drop shot in the tin. 8/6. Nick reacted, and played a fantastic drive that gripped to the wall like the Taxman on the world citizens. 7/8. Then Ong ended the game with a sumptuous drive, securing his place in the last day. After all the excitement, another good point to Nick Matthew - he is a very smiling loser! So Matthew was out. John White then explained to me that Thierry could still qualify for the final. So, the dice were still rolling…. If at this time last night, somebody told me that Thierry Lincou, the French number one, and World number two (and in that order if you please…) was going to play the final, I would have very kindly advised him to go and stop smoking the carpet. And you know, there is something funny. When Thierry plays against Peter Nicol, the Boss, I’m never anxious. Last year for example, Peter and Thierry played in the Super Series one of the best matches I ever saw (and I saw quite a lot). Peter went up in the 1st game 14/2 without one fault from either of the players. The perfect game also according to Neil Harvey, Peter’s coach. 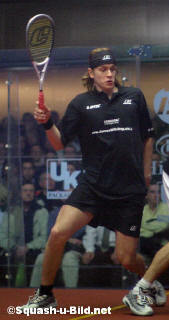 Peter Nicol seems to always bring out the best in Mr Lincou. So I was relaxed; pen (a new one) in hand, surrounded by the best people you can find on the Squash circuit, and off we went. “Please refrain from hitting the ball in the dangerous position, Mr Lincou” spoke the referee, after the Mr Lincou in question involuntarily hit his opponent on the left calf. Peter, his smiling self, made the crowd laugh by pretending to be mad at Thierry. God, the Boss knows how to make the audience love him! Very few mistakes in this game, not too many long rallies, not too long (7 minutes), and to my surprise (as Thierry has not played well in his first games during the event) my compatriot takes the 1st set 9/7. “Well”, I thought, “at least he is relaxed, and we are going to see a beautiful match”. In the second, Peter pined his drives to the wall, Thierry stretched his drives and cross courts to the millimetre, Peter anticipated, Thierry then mis-hit a few shots, and with a last back hand cross court deception, the Boss equalised, 5/9. In the 3rd, Nicol showed us how retrieving is spelled. In particular, the Frenchman played a right side drive that was the perfect length. And a fraction of a second before the ball died in the back well, Peter got it out and attacked it. And his deception shots in front of the court. You know the ones - he is about to play a delicate drop shot in the left corner, and a flick of the wrist later, the ball lands in the right corner. Peter was playing beautifully, but tonight, Thierry found the answers he didn’t have the night before. And especially, he unleashed his mental block. He had nothing to lose tonight. He won the 3rd 9/6. Was he going to ... Naaaaa. The rest of the match is anthology material. There was a point in the 4th (7/8 on Thierry’s serve and 3 lets) where after the rally, both players bent themselves in two, using their racquet as canes, to try and gasp a bit of air. All the rallies were cheered by the crowd. Peter returned Thierry's serve into the Tin. 8/8. After an interminable rally, Peter tins. Advantage Thierry (still sounds funny, doesn’t it). Let. Let. Let. A rally straight from Hell where Thierry refuses a stroke position and chooses to play on. 10 seconds later, Peter returns the favour, and in a last perfect shot that tear the air, my Thierry wins a 20 minute 4th set 10/8. “I’m out, aren’t I?” says Thierry as I approached him seconds after his victory. “What do you mean” I shout! You are in!” “No, I don’t think I am”. ”Don’t go anywhere” I say (as if the poor dripping thing had any intention of moving). I approach the tournament referee Linda Davie, join Colin McQuillan, my other eminent colleague, and wait. A few seconds later, Linda whispers to me “He is in the final”. “Are you sure?”. “Positive”, retorts the Lady in Chief. I fly to Thierry, and in French; “Tu es en finale, pépère [you’re in the final, old timer], and Peter is in the play-off”. He looks at me with astonishment and complete incredulity. “Are you sure”. “Oui”! Silence. “Naaaaaa”. “Mais si je te dis! [I promise you]”. Silence. “Until Peter tells me officially, I won’t believe it”. Poor Ong. Not sure that Peter is THAT happy to be only in the Play-Off. Thierry is ecstatic. So, who is he going to play??? Have you ever noticed how much John White looks like Nicolas Cage???? It’s pretty amazing… Watching the tall Scot warm up, his swing is the most natural I ever saw. He doesn’t hit, he caresses. And the ball shoots out. 55 minutes and 4 sets. For somebody who had blisters and was suffering like hell, Mr Beachill did pretty well! He wins the 1st one 9/5, with John helping him doing so by placing a few shots in the tin. The second game lasted forever. 5/5, 7/7, Deuce, Advantage Lee, Deuce, Advantage, Deuce, Advantage. “Oh, go on, for Pete’s sake”, seemed to say Lee. “I’m in pain here”! John eventually wins it in 19 minutes, after a festival of volley kills, and other flamboyant shots and mistakes. Yes, those two are having a great time in entertaining the crowds. And so do we. But good things always come to an end, and after wining the 3rd game pretty quickly 9/2, John White takes the 4th 10/8. There was a pretty amazing retrieving from the Tall Man at 3/2 in the 4th, Lee serving. John once again (he has done it a lot this event) threw himself on the floor. Flat down he went, stood up, runs to the other side of the court, battles with Lee to recover the direction of the rally, and plays a backhand volley kill nick! What more do you want???? Now we know that Beachill is out. So is it going to be a “John/Thierry’, or “James/Thierry” final ??? DEAR LORD, WHO TO CHOOSE? Well, I’m sure you do know by now. James Willstrop played a remarkable 27 minutes 3 setters against a not so motivated David Palmer. So Thierry Lincou will now face the young James Willstrop. As Steve Cubbins wrote in his report: “Who is Framboise going to support?”. Beats me. Don’t know guys. On one side, my compatriot, the first Frenchman ever to reach number one ranking. Don’t forget I’ve been around a few years, and I come from a time where there were no French players within the first 150 top players. 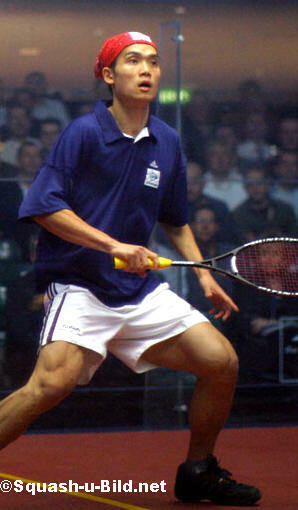 So, yes, I think Thierry Lincou is the best thing that ever happened to French Squash. And also, he has always, always, a perfect behaviour on and off the courts. I call him “Gentleman Thierry”. And I love his fragility and his humility. On the other side, the next World Number One, ladies and gentlemen, j’ai nommé (here it comes) James Willstrop. He is talented, he is hungry, and he is (unfortunately for me) still extremely young. He is solid, has a strong belief in his potential, a head firmly planted on his shoulders, and a heart of gold. You know what? I just don’t know. I just do not know. A bribe could be the answer…. No, I think I’ll probably do what Malcolm Willstrop does when Lee Beachill (who is has been coaching since Lee was 9) plays James Willstrop, his son. Pray for them to play their best, and make the Game of Squash proud. The cameras have arrived! I am in my element, at last! Robert Summers and Simon Clapham, the Proactive people, just arrived from the Bermuda Open (by the way, the weather was not that great, not really warm, quite variable, so I don’t regret not having been there then)! They have been working in partnership with PSA for years, and have been filming the Super Series events for yonks. They are working very hard to have everything in place for tomorrow’s finals. "Today, we are going to shoot some exteriors shots, to offer a sort of flavour of the place, and also film some action to explain the principle of the event. We want to be ready before tomorrow’s panic." Alan Thatcher is not only co-promoter of the event, he has been the “compere” through the all event, and tomorrow, will also do the commenting for Proactive. You men, ignore the pain in the racquet it is to go to public places and queue for the loo when you are a woman. Every time, queues for ever in the ladies’, in and out (the door) for the Men’s. Well, in these kind of events, more men come and watch the games, especially in a place like Canary Wharf. And guess who is queuing forever now????? I nearly caused a divorce two weeks ago. You see, when I was report about the Inter Counties Finals, in Lambs, in the City, I made a lovely little article about the referees, and, like I do systematically, I listed all the refs. Linda Davie (yet again), gave me a list with all the names, I just had to type them. AND I FORGOT MARY SCOTT MILLER! And as she told her husband that she was in Lambs refereeing, I let you imagine the rest…. Only joking, but I am officially apologising to the lovely lady, and the very professional referee that she is. Get away, I'm not ... am I ?? ?